I just got back from vacation (more on that soon, pinky swear) and while I miss having a made-to-order omelette (tomato-mushroom-cheese, thank you very much) every morning draped over a pre-split English muffin (all I had to do was lower the halves into the toaster) and sidling up to a rainbow of orange, green, and pink melon slices, it’s still good to be back in the kitchen. In an attempt to detox after snacking on fries everyday for a week, I created a higher-ish protein breakfast, replacing buttermilk with yogurt and using a bit of garbanzo flour. I dotted the pancakes with a pint of blueberries threatening to shrivel if they sat one more day on the counter. The result was a little less fluffy than my go-to pancakes, but otherwise a great addition to my weekend breakfast repertoire. I was feeling pretty proud of myself until I realized I had eaten half the batch. I put the remainder in a bag and in the freezer. Detox schmetox, I say. Adapted from Smitten Kitchen. In trying to up the protein content of these, I substituted chickpea flour for rye. The batter is very thick – thicker than my normal pancake recipe – and it doesn’t bubble very much after a couple of minutes on the pan, so you’ll need to peek underneath to see when it’s time to flip. The pancakes aren’t very sweet, and I lightly sprinkle with white sugar rather than maple syrup which would hide the blueberry flavor. Whisk. Whisk eggs and yogurt together in a medium/large bowl. If you use regular yogurt, you don’t need to add any milk; a thick Greek – add enough to thin it out to the consistency of cake batter, dripping from the whisk in a thin (not skinny) stream. Whisk in oil, vanilla, and lemon zest or extract. Layer. Add the flours, sugar, baking powder, and salt in a layer over the wet ingredients. Gently stir them to mix just the dry ingredients. (Or you could dirty another bowl for the dry ingredients). Stir. With a spatula, stir the dry into the wet only until the dry ingredients are moistened. A few lumps are ok. If you over-mix, the pancakes will be dense. The batter will be thick and when you drag your spatula through it, it will leave behind a trail of bubbles, the action of the baking powder. Cook, flip, repeat. Heat a pan (I used a cast-iron one) over medium heat and spray sparingly with canola oil (or use whatever fat you’d like). The pan is hot enough when you flick a few drops of water on the surface and they jump around and dance. Drop a scant 1/4 cup (about 3 tablespoons) of batter at a time, leaving space between each pancake. Press a small handful of berries into the top of each pancake. When the pancakes are dry around the edges and golden brown on the bottom, about 3 to 4 minutes, flip them and cook for another 3 minutes until golden underneath as well. (Start by making one small pancake at a time so you can adjust the flame to the right temperature before making the rest of the batch. Despite what they say about the pancake, I just think of it as the cook’s treat.) Continue to adjust the heat as necessary. Serve. Pile the pancakes high and serve with plain white sugar. I called Natasha last month to wish her a happy one-year skyrversary. On our trip to Reykjavik, we ate the thick creamy yogurt-like deliciousness at least once a day, often twice, once even thrice. Yes, it was lovely for breakfast but it really shines in dessert. Each of the restaurants we went to had a sweet skyr course, typically layered with something frozen and something crunchy. One night, blueberry sorbet and oats. Another, strawberries and green strawberry granita. And also, sorrel granita, hazelnut gelato, merengue, and blondies. I mean, seriously people, the desserts were insane. In the morning, I pulled the heavy pot from its oven incubator and was pleased to see that the curds had sunk to the bottom and the liquid whey had risen to the top. My plan was to strain the curds as if I were making Greek yogurt (not that I’ve made that), and then strain them a little bit longer. I lifted the pot and tipped it over a bowl to pour off the whey, but the curds slid out and I lost hold of the pot and the floor was soon a slick puddle of yogurt. Warm yogurt. Turns out, the scent of warm fermenting yogurt is not only unappealing but it permeates everything. After I mopped up the floor, I had to change outfits. And after a day outside, I thought I was coming home to a dairy farm. I’d like to say I got back on the horse, but I didn’t. I just moved on. One by one, I pulled together the components for an approximation of the simplest of our skyr desserts. There were blueberries to roast. Sorbet to churn. Cookie crumbles to bake. I then layered and layered and layered to compose a ridiculously complicated dessert. Layer. Fill a glass two-thirds with skyr. Cover with blueberry compote. Top with a scoop of sorbet. Sprinkle with cookie crumble. Drizzle with a few more roasted blueberries. Just barely adapted from Cheryl Sterman Rule‘s Yogurt Culture. This is actually the first time I’ve roasted fruit – strawberries, you’re up next! – and I like how the flavors concentrate differently than stove-top compote, making a more soup-like (as opposed to stew-like) compote. The berries wrinkle up as the oven dries them out and because they’re not crowded together in a pot, they don’t reabsorb their released juice. If your blueberries are tart (for example, the tiny ones from Maine), add up to a tablespoon more of sugar. Roast. Heat oven to 350°F. Toss 2 cups of blueberries with the sugar and spread on a parchment-lined baking sheet. Roast for 15-20 minutes until the skins burst, the berries shrivel up a bit, and the released juices thicken and slightly caramelize. Mix. Using a bench scraper, pull the berries and juices into the center. Carefully lift the long edges of the parchment towards the center and tip the berries and their juices into a bowl. Don’t wait too long or the juices will harden. Stir in the lime juice and let cool. Serve. Mix with yogurt (or skyr), drizzle over ice cream, or put a jar on a cheese plate. This recipe follows the guidelines for Any-Fruit Sorbet from The Kitchn. While making simple syrup is a bit fussy and not necessary for a berry sorbet, I added this step so I could infuse mint into the sugar water concentrate. Just a tiny bit of vodka helps lower the freezing point so that the sorbet doesn’t get too hard. Depending on what type of ice cream maker you have, you might need to put the canister in the freezer the night before. Simmer. Make simple syrup by combining sugar, water, and mint in a pot over medium-high heat. Simmer, stirring periodically, until the sugar dissolves. This is a very concentrated 2:1 sugar syrup as I didn’t want to add too much water. Remove from heat and cool to room temperature. Puree. Use a blender, immersion blender, or food processor to puree the simple syrup, berries, lime zest, and vodka until smooth. Strain. Strain mixture through a fine mesh strainer to get rid of any pesky blueberry skins and larger pieces of lemon zest. Taste. Add the lime juice and taste the mixture for sweetness. It should be a bit sweeter than you want because the sweetness dissipates during the freezing process .(How? I have no idea.) Way too sweet? Add lime juice, teaspoon by teaspoon. Too sour? Add sugar, tablespoon by tablespoon. Chill. Chill the base in the fridge until very cold, at least an hour. Churn. Pour the cold base into your ice cream machine and churn until the consistency of a thick smoothie. This takes about 25 minutes in my Cuisinart. Freeze. 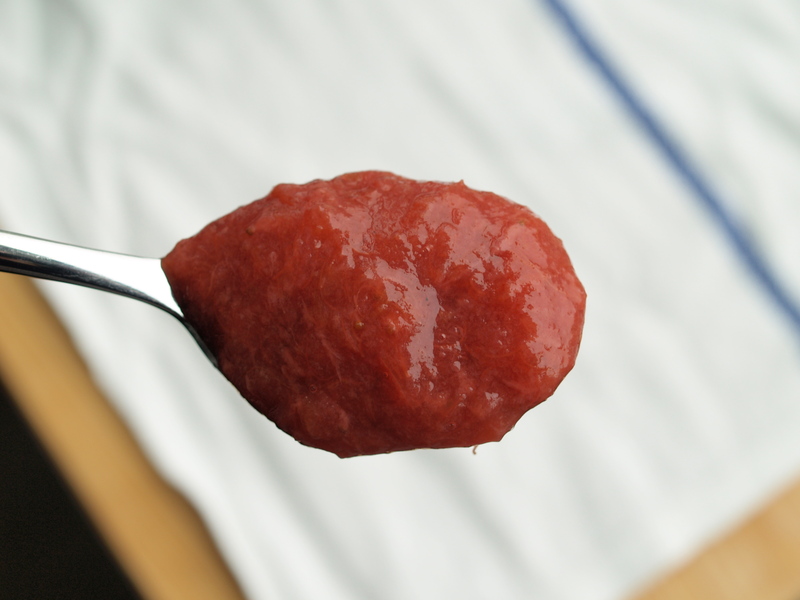 Transfer to a container or two, cover well, and freeze for at least four hours before serving. Pulse. In a small food processor, pulse together all ingredients until the mix resembles cornmeal. Bake. Spread evenly on a parchment covered baking sheet and bake in a 350ºF oven until it starts to brown, about 10 mins. Use 2 forks to break up chunks and return to oven. Bake for about 10 more minutes until golden brown, checking every 2-3 minutes to break up chunks and make sure that the pieces aren’t burnt. Once cool enough to handle, break up chunks until the size of grape nuts. Store. Store in an airtight container. Happy 4th from Central Park! I write to you from an old sheet spread out on a patch of grass just a few steps outside my apartment. Surrounding me (cross-legged with a laptop) are kids flying kites, a woman in an American flag inspired tutu, calypso music soaring out of an old-school boombox, and smoke from competing barbecues. I’ve been having my own little staycation here in Manhattan this long weekend. Yesterday, my sister and I did some bargain hunting at Century 21 on the tip of the island followed by our first attempt at Citi Biking along the river. It took a little while to get used to being on two wheels again – I don’t even spin – and we ended up on a pedestrian-only path, which a kindly gentleman pointed out to us in a voice loud enough for lady liberty to hear. We were pedaling along the (correct) biking path when I heard a rip: my favorite summer pants had given out. I muttered a few choice works and pouted. We dismounted, found the nearest dock, and returned our bikes. Still pouting, I covering my behind with my shopping bag and quickly found a place to change into a newly purchased dress. We went straight to dinner. Two glasses of champagne in, I received a text from Citi Bike: “You’ve had your bike out for a while and are being charged for extra miles…” There were a few more choice words followed by more pouting. We weren’t too far from the naughty bike and walked along the Highline to find and adjust it. Despite the mishaps, I’d totally Citi Bike again. But in leggings. But let’s back up a bit so we can talk about an actual recipe. That sheet that I’m sitting on is already spotted with grass stains and food drips (appetizing, I know) from Saturday afternoon when, after a lunch capped off by today’s crisp, some friends and I picnicked on snacks and watched a flamenco guitar and dance performance in Riverside Park. The origin of that crisp goes back to last weekend. Well, actually, it goes all the way back to Memorial Day weekend, if I’m going to be absolutely thorough. And, as you probably know, I do like to be thorough. I spent Memorial Day with Meira and her family. Knowing that her husband Alan’s favorite “fruit” is rhubarb – he’s so British! – I loaded up on the first stalks of the season and schlepped them out to their house on Long Island. In discussing what to do with the rhubarb, Alan requested something sweet but on the healthier side and without anything that would get in the way of the rhubarb taste. Before I had a chance to look up any recipes though, I got sick and had to cut my visit short, leaving the bright pink beauties behind. Last weekend, my parents came to town and we went out to Long Island for Shabbat dinner where I redeemed myself with a crisp with some end-of-season rhubarb. The filling was super tart – just rhubarb, lemon juice and zest, and a sprinkle of sugar – and the topping sweet like a crispy oatmeal cookie. Everyone, including Alan and my chocoholic father praised it (on the blue plate up top, you can see it’s a little runny), but I thought it could be slightly improved upon. With a revised crisp in mind, I organized a potluck Shabbat lunch as an excuse to test the tweaked recipe. I skipped the lemon, upped the sugar in the filling and dropped it in the crust, and reduced the amount of coconut oil. Only one farmer at my market had rhubarb on Friday and he told me that this is the last of the season, so I bought extra and there are now a few pounds of chopped rhubarb in my freezer. 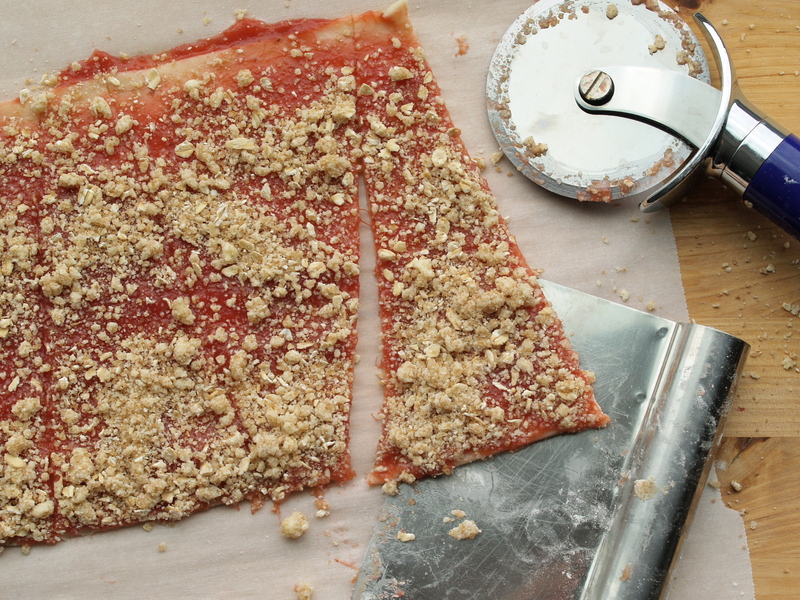 So, if you see some rhubarb, grab it while you can and throw together this crisp. Or muffins. 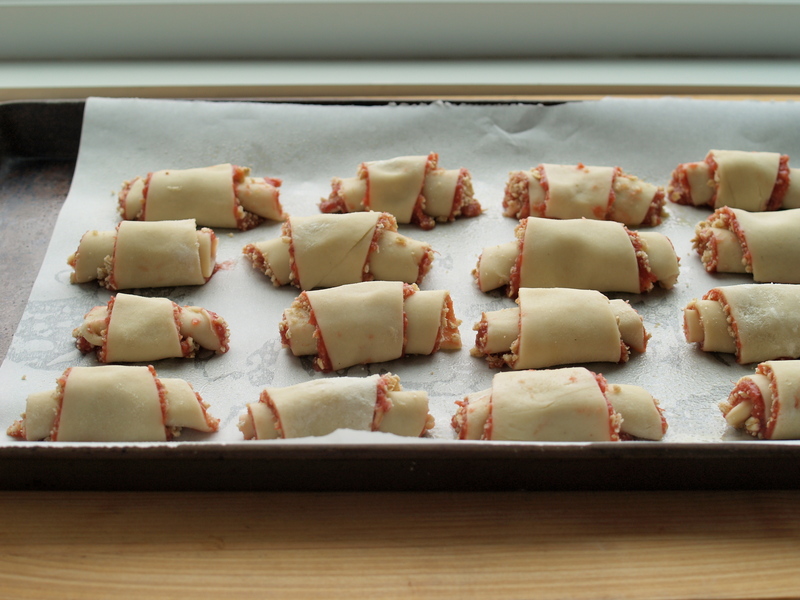 Or rugelach. Or compote. The filling is based on a recipe of Mark Bitman’s and the topping is adapted from a recipe I tested for a friend. My first take had a sweeter topping (a full cup of sugar) and tarter juicier rhubarb (1/4 cup sugar, one lemon for zest and juice, and no flour), so play with the proportions to get the balance that you’d like. When the fruit bakes down, you end up with a 1:1 ratio of filling to topping. I use a 9-inch deep-dish pie plate (7 1/2 inches on bottom) for a pretty thick crisp. You could also use an 8-inch square or, for a thinner crisp, a 10-inch tart or cake pan (not with a removable bottom). If you only have whole or slivered nuts, pulse the topping dry ingredients in a small food processor until nuts are chunky, then add egg and pulse a few more times until incorporated. This is best about 30 minutes after it comes out of the oven (or is reheated). Any leftovers? Top with a big scoop of yogurt, and you have breakfast. Prep. Heat the oven to 350°F. Mix filling. In the pie plate, toss the filling ingredients until evenly coated. Mix topping. In a bowl, mix together flour, oats, almonds, sugars, baking powder, and salt. Make a well in the center of these dry ingredients and add the beaten egg. Stir mixture with a fork until it gets crumbly, the consistency of cornmeal. Bake. Crumble the topping evenly over the rhubarb and drizzle with coconut oil. Bake until the top turns golden brown and fruit juices start to bubble up on the sides, 40 – 45 minutes. As everyone posts photos of their kids’ first days of school and France celebrates la rentrée, I’m still trying to wring the most out of summer. This salad is how I’m doing it. There have been a lot of outdoor days, but I have to say that I’ve enjoyed my fair share of reading in the air conditioning over a plate of this composed salad. It’s a classic hot-weather country pairing of crisp sweet watermelon and creamy, briny (but not too salty sheep’s) feta that I first tried in Israel. After having an Italian variation in my restaurant – we call it anguria and serve compressed melon with ricotta salata, shishito peppers, and toasted almonds – I bought my first of many watermelons this summer. For my version, the dressing is a blitz of lemon, oil, and a big fistful of mint. The more mint, the better in my book. 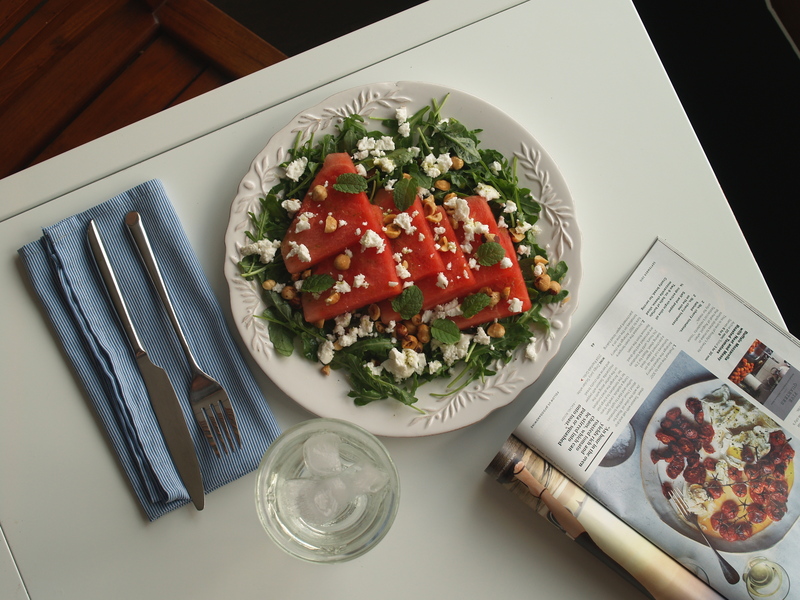 Toss the dressing with some arugula, arrange a few slabs of watermelon, dot with feta, and sprinkle with oven-toasted hazelnuts. Nothing to it. Elissa Altman on feeding her mother. Rachel Roddy on her two Italian kitchens. Molly Birnbaum on the late Oliver Sacks. Toss. Toss the arugula with half the dressing. Arrange. Divide the dressed arugula onto plates. 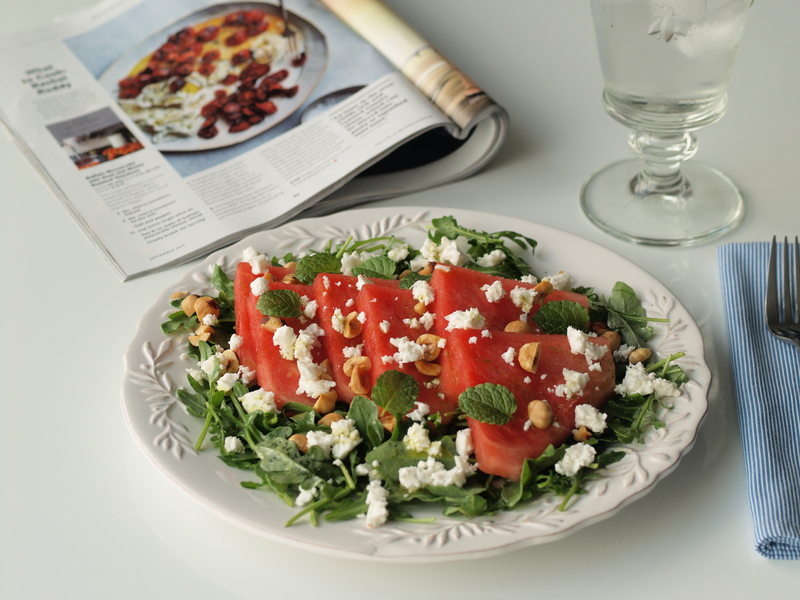 Lay watermelon slices artistically, and top with crumbled feta, hazelnuts, and a few mint leaves. Drizzle with remaining dressing. Mix. Use an immersion blender to mix all the ingredients together. I had my last piece of this cake for breakfast this morning. 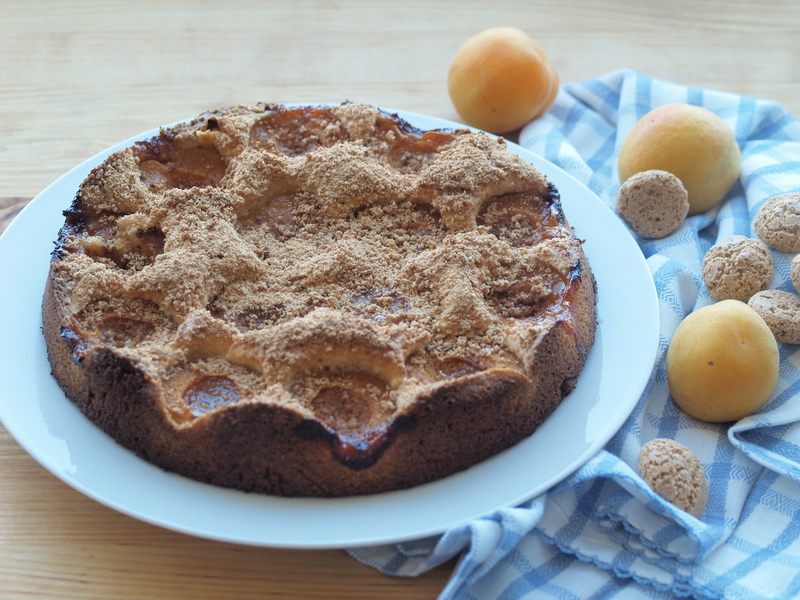 It’s the apricot cake I made for shabbat last week and after I shared it with my guests, I made another one for myself. All for me! I first made the cake with apples just a few months into this blog when I was hosting my first ever Rosh Hashanah dinner. It is, I believe, the most linked-to post on my blog and the recipe that my friends make year after year for their own families. Some actually refer to it at Gayle’s apple cake. I’m blushing. Today’s version is apricots with amaretti. Amaretti are crunchy little meringue cookies that have an almond flavor but are actually made with ground up apricot kernels (which are sometimes known as the poor man’s almonds because they taste like the nut, only slightly more bitter). Clearly a perfect match for the apricots I found in the market. Now, up until last week, I’d never tried a fresh apricot and I’m not really sure I was missing much. I twisted one open and it tasted like a lesser version of a peach, as if it was unwilling to share itself with anyone. But I had made up my mind to bake them into a cake, so I went ahead with my plan. Worst case, I had ice ream. Now fresh apricots might not be much to talk about, but cooked? Whew, cooked is where they shine. The heat loosens up their greedy grip on flavor and they transform. In the cake, they slump into the batter and release syrup that pools in the wells left by the pits and leaks into the cake. 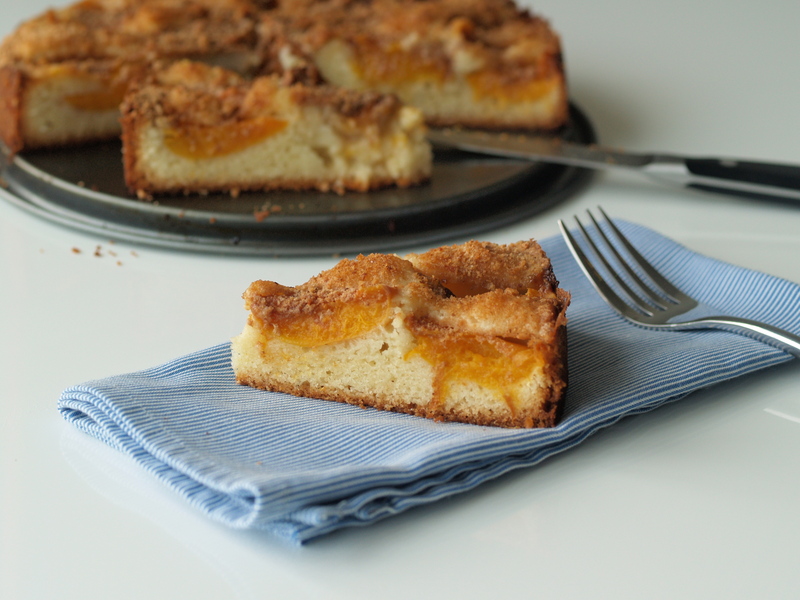 Out of the oven, the cake has a dense crumb – just the way I like it – with pockets of sticky apricot and the crunch of almond-flavored cookies. A little reminiscent of coffee cake, which, again makes me feel justified eating it for breakfast. This is a variation on my any-fruit back-pocket cake (see below). Prep. Preheat oven to 350˚F. Grease and flour a 9-inch round cake pan or springform. Mix. Mix together the oil, sugar, eggs, and extracts until smooth. Add the flour, baking powder and salt and continue mix by hand until the ingredients just come together. Arrange. Tip the batter into the prepared pan. The batter is thick, so you’ll need a spatula to scoop it all out and then spread it evenly in the pan. Arrange the fruit however you want. Halves skin-side down make a dramatic cake as the fruits sink quite a lot and you end up with a craggy cake moonscape. Quarters balanced on their sides allow the cake to rise more evenly, resulting in a more, well, traditional cake. Sprinkle with the crushed cookies. Bake. Bake the cake for 40-45 minutes until a toothpick comes out clean. Watch the fruit to make sure its juices don’t burn. This recipe was adapted from Marian Burros’ plum torte published in the New York Times. I replaced the butter with oil to make it parve and like to use different fruits depending on what’s in season. The batter is thick but still pourable; a few swipes of a spatula gets it right into the pan. The fruit juices ooze all over and dribble beautiful color throughout the cake. Any type of juicy fruit works. Mix. Mix together the oil, sugar, eggs, extract, and zest until smooth. Add the flour, baking powder and salt and continue mix by hand until the ingredients just come together. Arrange. Tip the batter into the prepared pan. The batter is thick, so you’ll need a spatula to scoop it all out and then spread it evenly in the pan. Arrange the fruit however you want and sprinkle with raw sugar. Bake. Bake the cake for 40-60 minutes until a toothpick comes out clean. Apples and pears take close to the full hour; stone fruits burn more quickly, so I take them out around 45 minutes. 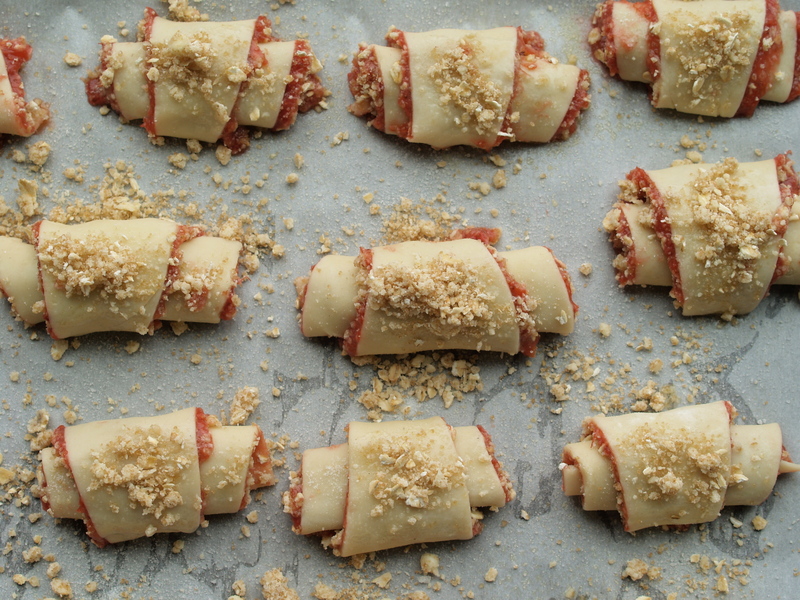 In the introduction to her book, Mindy writes “Spring is here only after I’ve made strawberry rhubarb rugelach.” With the weather we were having, I was ready to do anything to will spring on. Anything. Even spend two days making cookies. So, I picked up a few pounds of strawberries. No, not the ones below – these I snagged this morning at the farmers market (!!!) – but a plastic box of uniformly red, decent enough berries. I grabbed a couple stalks of rhubarb, also from the grocery store, and heated them up with the berries. Everything mushed together, eventually slumping into a soft pot of preserves, sweet with berries, tart with rhubarb, and just enough sugar to help the grocery store produce along. I pulsed together an oatmeal streusel crumble. And made a cream cheese dough that I covered with fruit and sprinkled with streusel. I sliced the dough into triangles. OK, officially, those are trapezoids. And covered them with more streusel. And popped them in the oven. Through the glass, I could see the dough puffing and browning and falling. The pink fruit bubbling and leaking from its spiraled home. 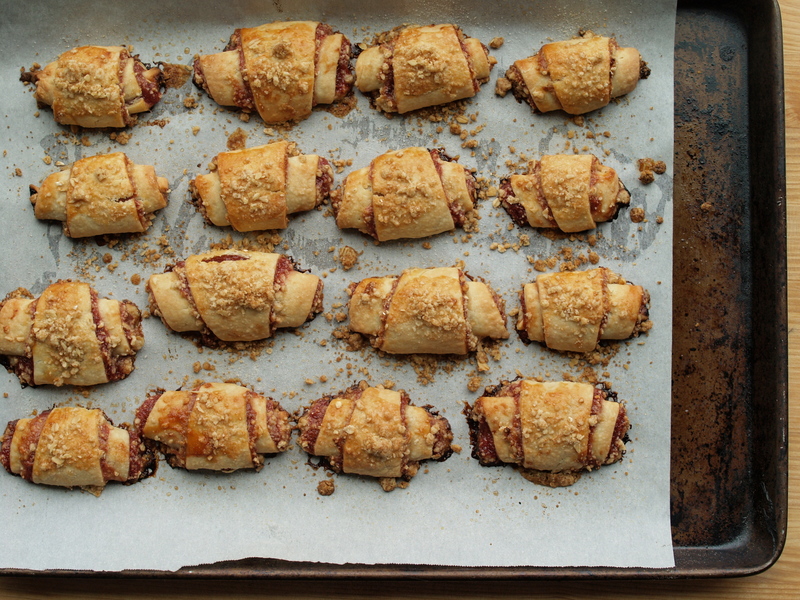 Out of the oven, the rugelach cooled, and dribs and drabs of caramelized preserves hardened into edges of brittle. The dough was soft and flakey, ribboned with pucker-y berries, and punctuated by nubbins of crispy streusel. I thought about eating them all. Myself. But I didn’t. I shared. From Mindy Segal’s Cookie Love. I’ve modified the order of the steps and some of the language to best reflect how I made the rugelach. The recipe is long, so make sure to read through the whole thing through before starting. There are a lot of components to make here and many ingredients require chilling, so I made these over the course of two days. On the morning of day 1, I macerated the fruit and let it sit in the fridge for a few hours. Later that evening, I cooked down the fruit preserves and then prepared the cream cheese dough, chilling it overnight. 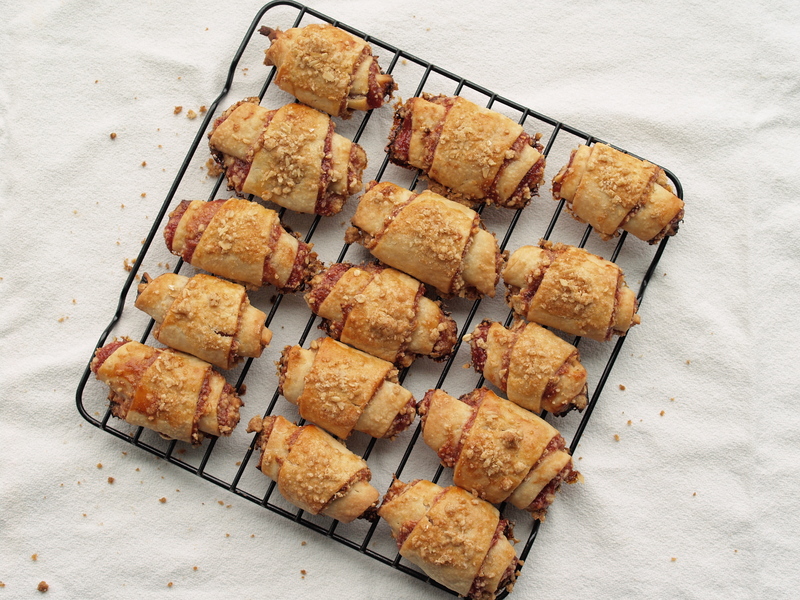 On day 2, I made the oatmeal crumble and then assembled and baked off the rugelach. Roll out. Put a sheet of parchment paper the same dimensions as a half sheet (13 by 18-inch) pan on the work surface and dust lightly with flour. Remove one dough half from the refrigerator (it should have been chilling for at least 2 hours and should be pretty solid) and place on top. Using a rolling pin and a pastry roller, roll the dough half into a rectangle, leaving a 1-inch border from the edge of the parchment paper. The dough should be just shy of ¼-inch thick. If the edges become uneven, push a bench scraper against the sides to straighten them out. To keep the dough from sticking to the parchment paper, periodically dust the top lightly with flour, cover with another piece of parchment paper, and, sandwiching the dough between both sheets of parchment paper, flip the dough and paper over. Peel off the top layer of parchment paper and continue to roll. Repeat with the second dough half. Chill. Stack both sheets of dough on top of each other and refrigerate until chilled, approximately 30 minutes. Heat. Heat the oven to 350°F. Line a few half sheet pans with parchment paper and lightly coat with nonstick cooking spray. of parchment paper. 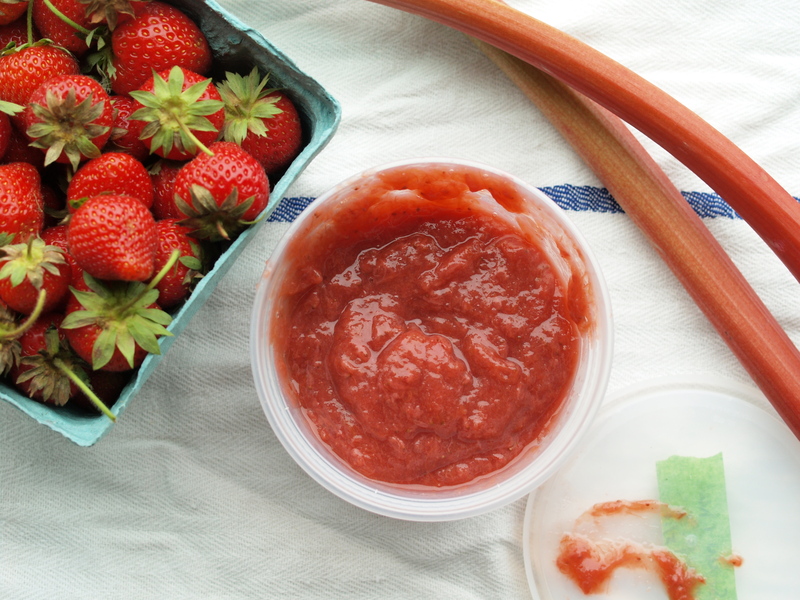 For each sheet of dough, spread ¾ cup of strawberry rhubarb preserves in a thin, even layer across the surface. Sprinkle approximately ½ cup of streusel per sheet over the preserves. Trim the edges. Slice. 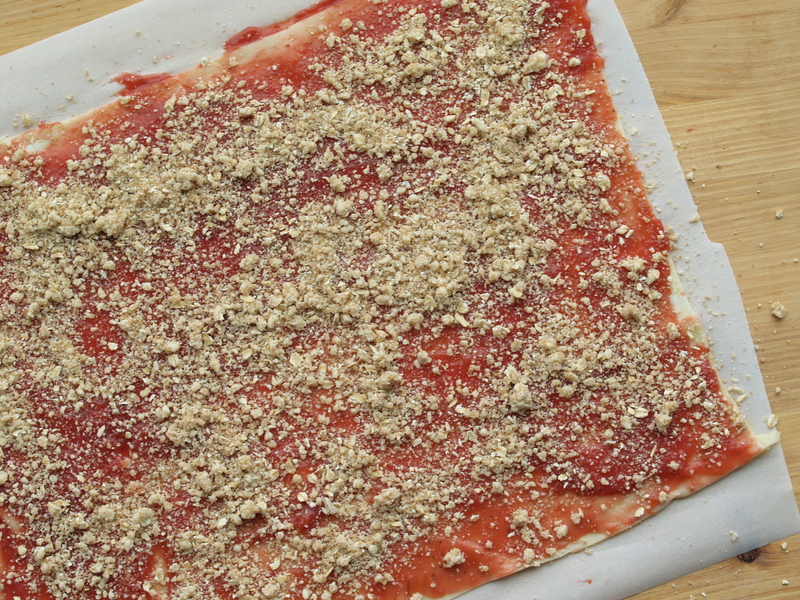 Using a dough cutter or a pizza cutter, divide the sheet in half lengthwise into two long strips. Working with one strip at a time and moving crosswise, cut out triangles with flat tips, with each base approximately 1½ inches wide and each tip approximately ¼-inch wide. Shoot for 12 triangles per strip. Bake. Bake one pan at a time for 15 minutes. Rotate the pan and bake for another 8 to 10 minutes, or until the streusel is golden brown. Cool. Let the cookies cool on the sheet pan for 1 to 2 minutes (do not wait too long or the preserves will stick to the parchment paper). Using an offset spatula, transfer the cookies to a wire rack to cool completely. Repeat with the remaining dough. Store. 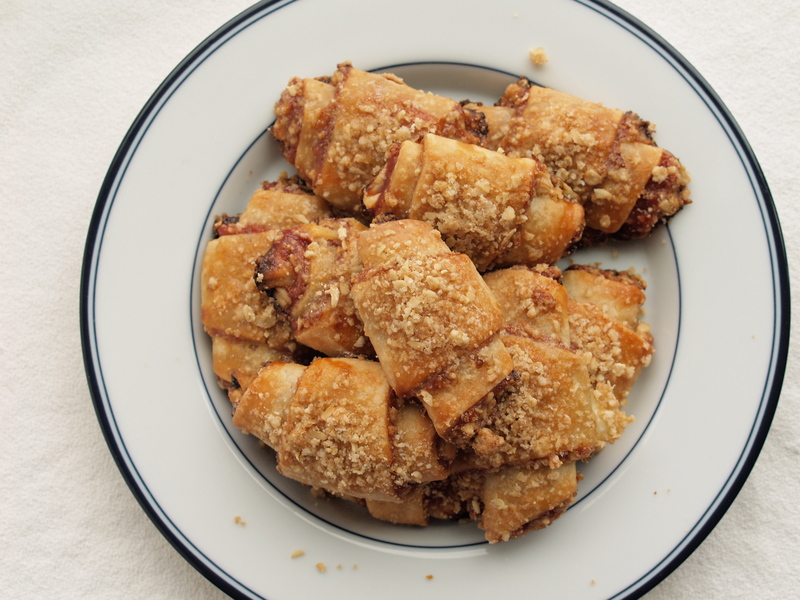 Rugelach can be stored in an airtight container at room temperature for up to 5 days. 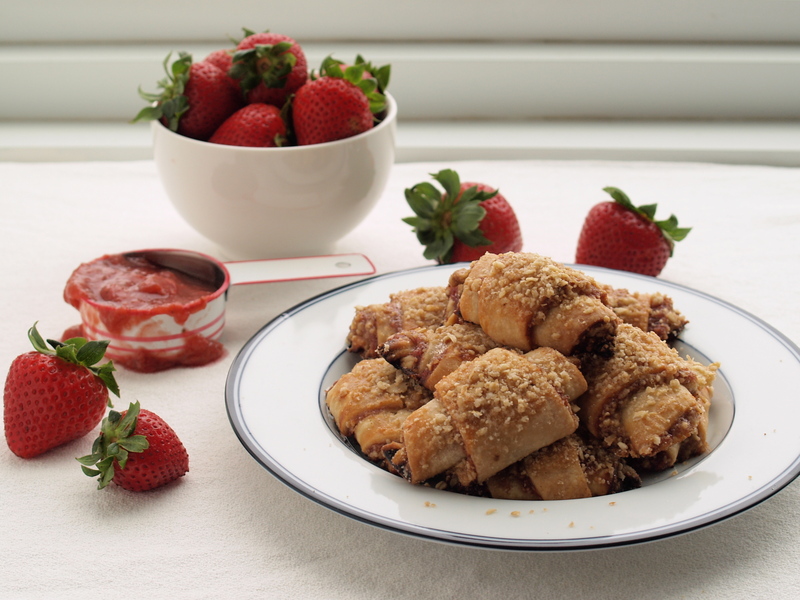 Rolled, unbaked rugelach can be refrigerated for up to 1 week. From Mindy Segal’s Cookie Love. This is the basic cream cheese dough that Mindy uses for rugelach, kolachkes, and even her own version of fig newtons. The dough really needs to stay cold, so I popped it back in the fridge a few times while I was rolling it out if it started to feel too delicate. I saved half of the cream cheese dough and brought it to a friend’s house – her daughters and I rolled out the dough and stuffed it with a combination of peanut butter, chocolate chips, and butterscotch chips. Mix. In the bowl of a stand mixer fitted with the paddle attachment, mix the butter on medium speed for 5 to 10 seconds. Add the cream cheese and mix on medium speed to combine, 10 to 15 seconds. Add the sugar and beat on medium speed until aerated, approximately 3 minutes. Scrape the sides and bottom of the bowl with a rubber spatula to bring the batter together. Mix some more. On medium speed, add the vanilla, mixing briefly until incorporated. Scrape the sides and bottom of the bowl with a rubber spatula to bring the batter together. In a bowl, whisk together the flour and salts. Add the flour mixture all at once and mix on low speed until the dough just comes together but still looks shaggy, approximately 30 seconds. Do not overmix. Remove the bowl from the stand mixer. With a plastic bench scraper, bring the dough completely together by hand. Chill. Stretch two sheets of plastic wrap on a work surface. Divide the dough in half (each half will weigh around 14½ ounces) and place a half on each piece of plastic. Pat the dough into rectangles, wrap tightly, and refrigerate until chilled throughout, at least 2 hours or up to 1 week. From Mindy Segal’s Cookie Love. 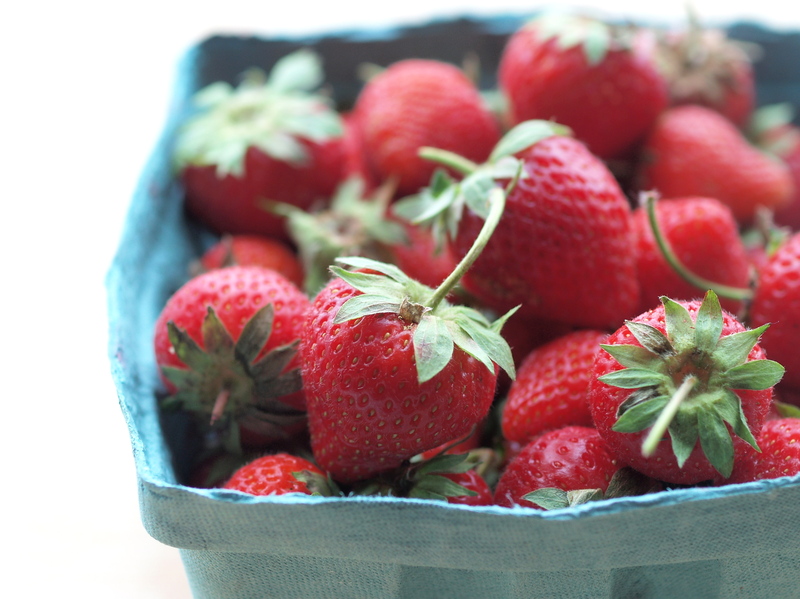 To get one pound of hulled strawberries, you’ll need to start with about 1.5 pounds of unhulled berries. These preserves are definitely puckery – which works nicely for the regulach since the streusel adds another sweet element and baking seems to intensify the fruit’s sweetness – but you might want to add more sugar to taste. Any leftover preserves are great mixed with yogurt or poured over ice cream. 4 hours at room temperature or cover and refrigerate overnight. 2 cups. Transfer to a storage container and refrigerate until completely chilled, at least 2 hours. From Mindy Segal’s Cookie Love. Pulse. 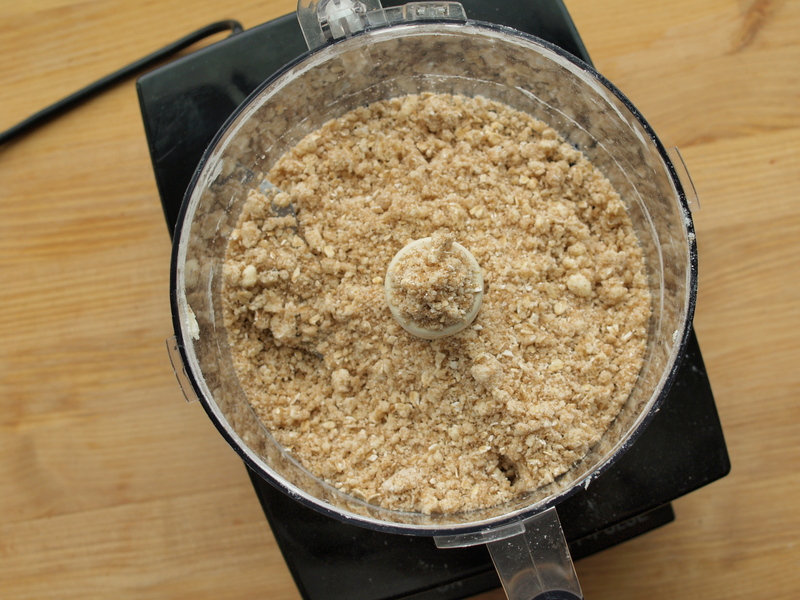 In a food processor, pulse together the butter, sugar, flour, oats, and salt until it forms a fine meal, and the butter is evenly incorporated. Do not over-process. Chill. Transfer to a storage container and chill completely, approximately 1 hour. Or freeze and use within 1 month.